As I have said before Survivial Backstroke goes by lot of names. But if you swim survival backstroke it is still survival backstroke whatever you call it. So for the sake of clarity, I am going to always refer to this stroke as survival backstroke because that's the name I was taught. This stroke is an easy stroke to master and is usually taught in conjunction with breaststroke. It is important to emphasize the symmetry of this stroke, particularly the leg action. Swimmers must use landmarks as guides as they cannot see where they are going otherwise. 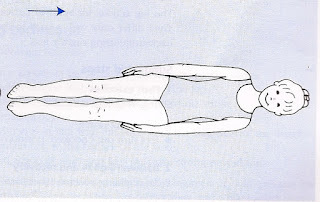 You start the stroke from a streamline position; on your back with your body straight and arms by your sides in a glide position (Fig 1). From the glide position (Fig 1) your legs should bend at the knees and drop down to a vertical position with your feet dorsi-flexed and averted. Your knees should be slightly apart, but no wider than your shoulders (Fig 2). Your arms bend at the wrist and elbow to allow your hands to move to shoulder level (Fig 2) while remaining very close to your body, 'thumbs along the rib cage' (Fig 3). It is important to keep the hands and arms close to the sides of your body to enhance streamlining and maintain body heat. 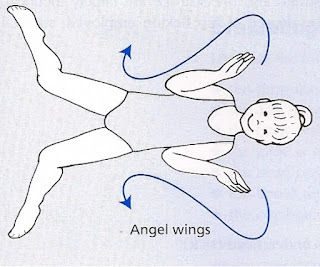 When your hands reach your shoulders, they extend beyond your shoulders, elbows bent and hands facing away from your body and towards your feet (Fig 4). 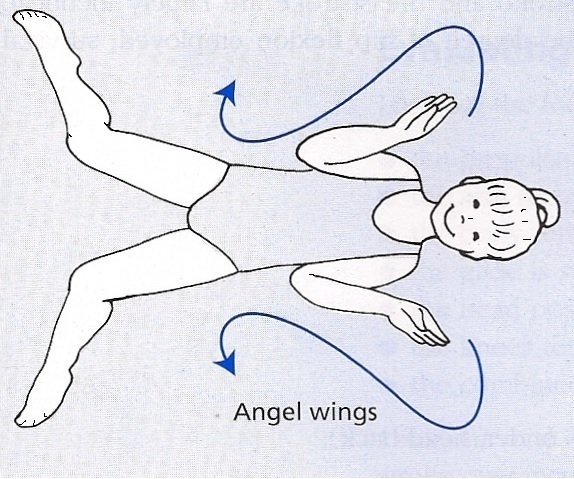 Your arms follow a curve; 'drawing wings' until your hands and arms reach the glide position (Fig 1). The action of both your arms and both your legs, should be symmetrical and all happen at the same time. This is what give you your propulsion. The leg action is similar to the breaststroke only in reverse. The feet are swept in an accelerating circular motion, outwards, backwards and upwards (Fig 3), ending with the feet together, plantar-flexed, in the glide position (Fig 5). Thus the movement of both your legs is symmetrical and happens at the same time. 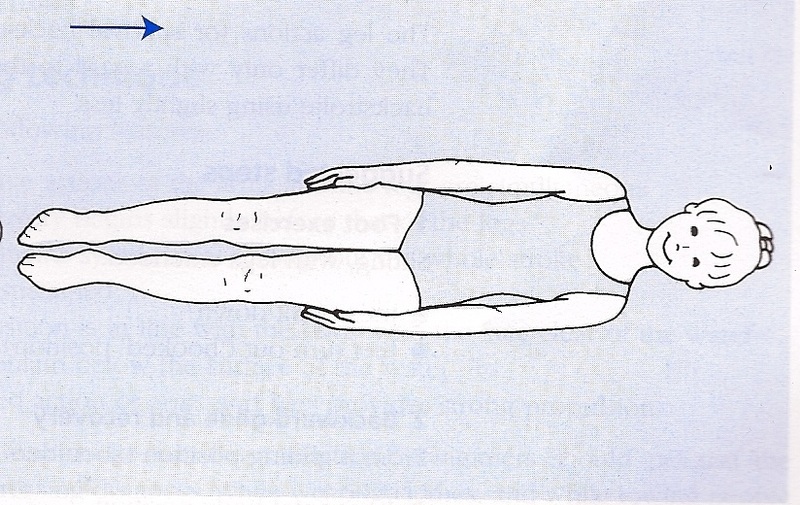 The propulsive phase; when both arms and both legs move together to the glide position; from Fig. 4 to Fig. 5, Should happen as rapidly as possible, so as to avoid too much loss of heat in the process. Arms and legs move together to complete the glide for survival backstroke. You need to maintains a streamlined glide position until your momentum of slows. Then and only then, should you repeat the stroke. Breathing is natural - usually exhalation occurs with propulsion but there is no reason not to do it as you feel the desire or need. Here you can see a video of the complete survival backstroke in action along with the sidestroke.